Robotic vacuum cleaner with deep learning and chocolate drink machine unveiled as examples of new development approach. In its first 100 years, the proliferation of Panasonic's washing machines, vacuum cleaners and consumer electronics have dramatically improved lifestyles around the world. In recent years, however, changing demographics and higher life expectancies - not to mention life-changing technologies like social media and IoT - have given rise to lifestyles that are increasingly diverse. In light of these societal changes, how should Panasonic adapt? Tetsuro Homma, CEO of Panasonic Corporation Appliances Company, addressed this question at the Cross-Value Innovation Forum 2018, a special week-long event held in Tokyo to celebrate Panasonic's 100th anniversary. Over the course of his presentation, Homma outlined how Panasonic's products will evolve in the era of big data, IoT and AI. 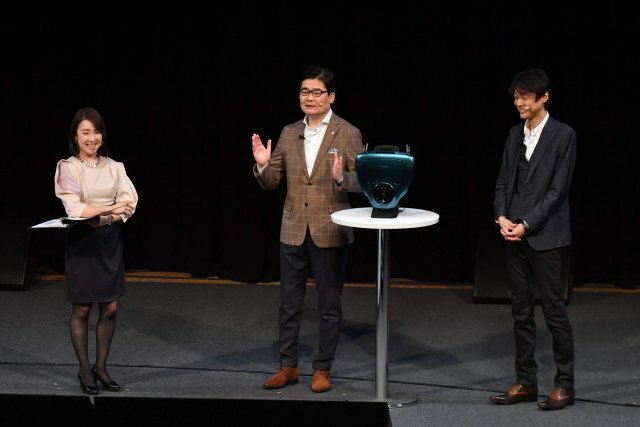 To preview what to expect from Panasonic, he invited special guests to demonstrate a robotic vacuum cleaner with state-of-the-art deep learning and introduced an unexpected product: a chocolate drink machine. Homma opened his presentation by explaining that the era of product ownership, consumption and mega hits has long since passed. "That's why we decided to go back and take the customer's perspective, expanding our business beyond appliances to services," he said. He noted that the rapid development of AI, big data and internet infrastructure will lead to greater connectivity and new types of businesses. As an example of changing lifestyles, Homma cited the new 'ordinary family' that is emerging, one with family members that live apart from each other. "But they still want to be connected and share a meal," he noted. Homma presented a concept where home-cooked meals can be distributed to family members wherever they are. "'Borderless dining' is an example of how Panasonic can be useful to people," he said. To give a concrete example of Panasonic's new approach to improving people's lives, Homma invited Dr. Takayuki Furuta, General Manager of the Future Robotics Technology Center at the Chiba Institute of Technology (fuRo), to demonstrate a robotic vacuum cleaner concept jointly developed by Panasonic and fuRo. Panasonic already offers the RULO robotic vacuum cleaner, but this concept model represents a major step forward since it incorporates state-of-the-art robotics and AI technologies. Homma explained that products like these require a collaborative development approach, one that emphasizes speed to meet people's needs quickly. "Teaming with fuRo, we took a completely different approach so it only took three months to develop," he said. Homma explained that the robotic vacuum cleaner can be operated over WiFi using a tablet. A user can identify specific areas to vacuum and the cleaner does not waste time searching for its charging station. It generates maps and can sense people close by. The cleaner can even follow people around like a pet! "The autopilot technology in this robotic vacuum cleaner is the very latest, and deep learning is integrated into the floor sensor - that's what makes it different," Furuta explained. He then proceeded to show how the cleaner's AI enabled it to climb up onto a rug. Furuta was impressed at Panasonic's speed in the development process, noting that he received instant responses from Homma to his emails. "Not only did I see the evolution of a vacuum cleaner; I witnessed the evolution of Panasonic itself. It was like working with a venture company," he remarked. And Makoto Haruta may bear some responsibility for the change in pace. Haruta is President of BeeEdge, a joint venture between Panasonic and San Francisco based venture capital firm, Scrum Ventures. BeeEdge acts an accelerator by identifying under-utilized technologies within Panasonic and matching them with entrepreneurs to create independent startups. "Large companies have a lot of good ideas, but it can take a lot of time to develop them," said Haruta. "So they can use startups to accelerate the process." BeeEdge's mission is to discover new needs and value that no one is yet aware of. As a case in point, Homma and Haruta revealed the first fruit of the joint venture, a chocolate drink machine developed by Mitsubachi Products, which was launched by BeeEdge in September. Using Panasonic's existing steam pipe technology, the machine brews delicious chocolate drinks with high-quality cocoa beans. "Creating a new market is like creating a new culture," Haruta said. "We didn't have a culture of buying water before, but that changed with bottled water." Such an example, is the use of hydrogen fuel cell technology within the home, which Homma said could play a key role in the democratization of energy, without climate change causing emissions. Panasonic holds the number one market share in Japan and is selling the technology in seven European countries including Germany. Homma closed the session by saying that the challenges for the Appliances Company have only begun. He shared his resolve to expand Panasonic's expertise from homes to platforms and cited a specific objective - by 2021 intelligence will be built into all home appliances. "We're committed to updating the lifestyles of each and every customer," he said. Mr. Makoto Haruta, President of BeeEdge Co., Ltd.
[Photo] Business Session: Evolving from "Consumer Electronics" to "Lifestyles"